Introducing something special for your garden. A strong, low maintenance, reliable shrub. Blooms for much of the year. 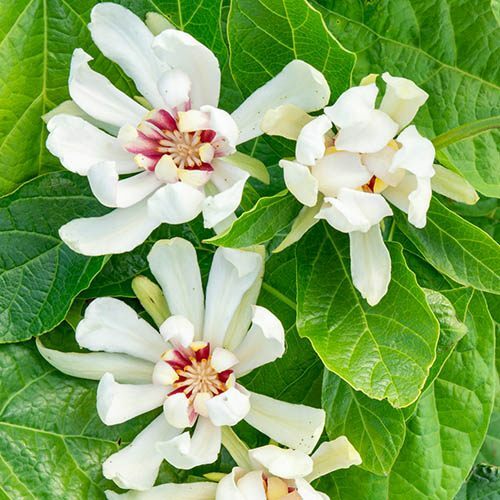 Sinocalycanthus 'Venus', also known as the Carolina Allspice, is a bushy shrub that will become the focus of your garden with its large showy flowers and butter-coloured autumn display. One of the more exclusive shrubs that you can acquire for your garden, Sinicalycanthus is the end result of an intense breeding program and is rarely offered for sale in garden centres, so this is your chance to get your hands on something really rather special. The main show is from late spring into summer when 'Venus' erupts with a fabulous show of large, magnolia-like, creamy-white flowers with yellow and purple central splashes. The eyecatching blooms are beautifully scented and the first flush will last for several weeks in late spring, before blooming on and off right through until the autumn. There's then the added bonus in autumn when the large, glossy green leaves turn yellow and transform into honey-brown before falling. A strong, reliable grower and fully hardy, Venus is a low maintenance option for those of us with little time to worry about complicated care routines - just prune out any dead or damaged branches and that's it! Supplied as an established plant in a 13cm pot, ready to be planted out. Supplied as an extablished plant in a 13cm pot. Pruning shoud be carried out in spring when only dead or damaged wood needs removing.